Att. Gen. Bob McDonnell resigning from post to run for governor. RICHMOND, Va. -- Virginia Attorney Gen. Robert McDonnell announced Tuesday that he will resign from his current post Feb. 20 to launch full-time into a gubernatorial run. In an e-mail to his staff, McDonnell said he wanted to be sure the commonwealth's residents would have an attorney general who could devote their full time to the position. He added, "This has been a very difficult decision to make because of my love for this office and all of you." McDonnell said he will keep with political tradition in Virginia. In recent years, attorney generals from both parties have resigned to run for governor. The Virginia House and Senate, controlled by two different parties, will now have the task of appointing a replacement. Chief Deputy Attorney Gen. William Mims is said to be the front-runner as a replacement. 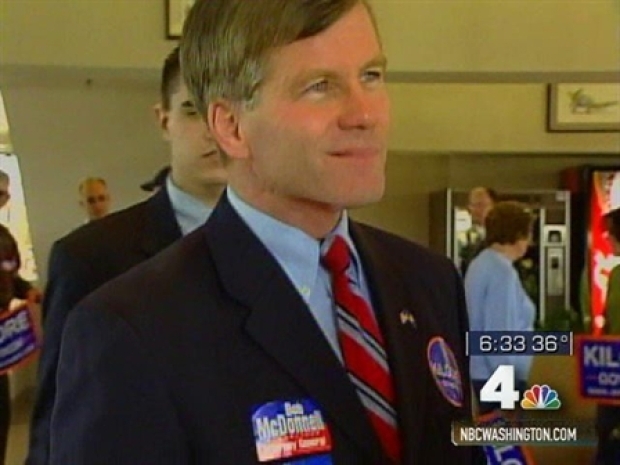 Virginia Attorney General Bob McDonnell announced he's stepping down later this month to focus on his bid for governor. McDonnell will run as a Republican candidate for governor. Former Delegate Brian Moran of Alexandria, Sen. R. Creigh Deeds and former DNC Chairman Terry McAuliffe are expected to run for the Democratic spot.